Mildred Elizabeth Fish Harnack (née Fish; 16 September 1902 – 16 February 1943) was an American-German literary historian, translator, and German Resistance fighter in Nazi Germany. Mildred Elizabeth Fish was born in Milwaukee, Wisconsin, one of four children born to William C. Fish and Georgina (née Hesketh) Fish. She attended West Division High School (now Milwaukee High School of the Arts), but finished up her last year at Western High School in Washington D.C. In 1926, she was studying and working as a lecturer on German literature at the Milwaukee State Normal School (now the University of Wisconsin–Milwaukee). She met the jurist Arvid Harnack, a Rockefeller Fellow from Germany, at the University of Wisconsin-Madison, where she earned a Bachelor of Arts in English on June 22, 1925 and a Master of Arts in English on August 6, 1926. They later wed in a ceremony at her brother's farm near Brooklyn, Wisconsin. One of her teachers at the University of Wisconsin was William Ellery Leonard. A fellow student and friend was poet Clara Leiser. She finished her senior thesis in 1928: "A Comparison of Chapman's and Pope's translations of the Iliad with the Original". During her time at Madison, she also worked on the Wisconsin Literary Magazine. From 1928–29, she taught English at Goucher College in Baltimore, Maryland. In 1929, she and her husband moved to Germany, where she worked on her doctorate at the University of Giessen. In 1930 she moved from Giessen to Berlin to be with her husband, and to study at the University of Berlin on a fellowship from the Alexander von Humboldt Foundation. She worked as an assistant lecturer (English and American literature and language) and a translator. She was also involved with the American Student Association, the American Women's Club—where she served as president, the Berlin chapter of the Daughters of the American Revolution—where she served as secretary, and the American Church. It was during her time in Berlin that she became interested in the Soviet Union and Communism, seeing them as a solution to poverty. In 1932, however, she was let go from her teaching position, as were many other women and foreigners. She toured the Soviet Union later that year with her husband and leading academics. In 1933, Fish-Harnack began teaching English literature at the Berliner Abendgymnasium (evening secondary school). She sometimes discussed economic and political ideas from the United States and the Soviet Union with her students. She also joined the National Socialist teachers' organization, as required by law. She edited a book column in an English-language newspaper Berlin Topics along with the US Ambassador's daughter Martha Dodd. She also wrote in German for Berliner Tageblatt and Die Literatur until 1935, when the Nazis' strictures made this too difficult. In 1936, she published her German translation of Irving Stone's biography of Vincent van Gogh, Lust for Life. She continued to work as a translator for various publishing companies. In 1937, Fish-Harnack visited the United States and went on a campus lecture tour whose theme was The German Relation to Current American Literature. Together with her husband Arvid, the writer Adam Kuckhoff and his wife Greta, Fish-Harnack brought together a discussion circle which debated political perspectives on the time after the National Socialists' expected downfall or overthrow. From these meetings arose what the Gestapo called the Red Orchestra (Rote Kapelle) resistance group. In 1940–41, the group was in contact with Soviet agents, trying to thwart the forthcoming German attack upon the Soviet Union. Fish-Harnack even sent the Soviets information about the forthcoming Operation Barbarossa. Meanwhile, she was making contact with people who were against the Nazi régime, recruiting some for the resistance, and serving as go-between for her husband, other members of the Red Orchestra, and Soviet agents. In July 1942, the Decryption Department of the Oberkommando des Heeres managed to decode the group's radio messages, and the Gestapo pounced. On 7 September, Arvid Harnack and Mildred Fish-Harnack were arrested while on a weekend outing. At this time, Mildred had been teaching English at the Foreign Studies Department of the University of Berlin. Arvid Harnack was sentenced to death on 19 December after a four-day trial before the Reichskriegsgericht ("Reich Military Tribunal"), and was put to death three days later at Plötzensee Prison in Berlin. Mildred Fish-Harnack was initially given six years in prison, but Hitler refused to endorse the sentence and ordered a new trial, which ended with a sentence of death on 16 January 1943. She was beheaded on 16 February 1943. Her last words were purported to have been: "Ich habe Deutschland auch so geliebt" ("I loved Germany so much as well"). She was the only American woman executed on the orders of Adolf Hitler. Following her execution, as with her husband and colleagues, her body was released to Humboldt University anatomy professor Hermann Stieve to be dissected for his research into the effects of stress, such as awaiting execution, on the menstrual cycle. After he was through, he gave what was left to a friend of hers, who had the remains buried in Berlin's Zehlendorf Cemetery. She is the only member of the Red Orchestra whose burial site is known. When her friend and colleague Clara Leiser learned of the execution, she wrote the poem To and from the guillotine in remembrance of her friend. Stone, Irving (1936), Vincent van Gogh. Ein Leben in Leidenschaft [Lust for Life], Berlin: Universitas . Edmonds, Walter D (1938), Pfauenfeder und Kokarde [Drums along the Mohawk], Berlin: Universitas . Harnack, Mildred (1941). Die Entwicklung der amerikanischen Literatur der Gegenwart in einigen Hauptvertretern des Romans und der Kurzgeschichte [The Development of Contemporary American Literature with some Main Representatives of the Novel and Short Story]. Gießen: Philosophische Fakultät der Ludwigs-Universität zu Gießen. Harnack, Mildred (1988). Variationen über das Thema Amerika: Studien zur Literatur der USA. Berlin: Aufbau. ^ a b c Biographical Timelines: Mildred Fish and Arvid Harnack Archived 2010-09-27 at the Wayback Machine; accessed 6 May 2014. ^ a b "Mildred Fish Harnack". Wisconsin Women Making History. Retrieved 16 February 2016. ^ Shareen Blair Brysac (2000). "Resisting Hitler: Mildred Harnack and the Red Orchestra Cast of Characters". TRACES. Archived from the original on 28 January 2014. Retrieved 3 January 2014. 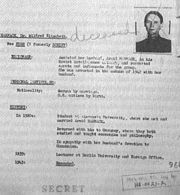 ^ "Wisconsin's Nazi Resistance: The Mildred Fish-Harnack Story Transcript" (PDF). Wisconsin Public Television. .
^ Bazelon, Emily (7 November 2013). "What Happened to the Remains of Nazi Resister Mildred Harnack? Now We Know". Slate. Retrieved 7 November 2013. ^ Ihde, Jennifer. "Late 1940s, a friend's poem". Honouring Mildred Fish Harnack. University of Wisconsin. Archived from the original on 2011-08-14. Retrieved 2012-01-11. Brysac, Shareen Blair (2000). Resisting Hitler: Mildred Harnack and the Red Orchestra. New York: Oxford University Press. ISBN 0-19-515240-9. Nelson, Anne (2009). Red Orchestra: The Story of the Berlin Underground and the Circle of Friends Who Resisted Hitler. New York: Random House. ISBN 978-1-4000-6000-9. Roloff, Stefan (2002). Die Rote Kapelle. Die Widerstandsgruppe im Dritten Reich und die Geschichte Helmut Roloffs (in German). Berlin: Ullstein. ISBN 3-548-36669-4. Wikimedia Commons has media related to Mildred Harnack. Wisconsin's Nazi Resistance: The Mildred Fish-Harnack Story, Wisconsin Public Television video; accessed 6 May 2014. When the Red Orchestra Fell Silent, New York Times; accessed 6 May 2014. This page was last edited on 19 April 2019, at 17:15 (UTC).